"This 49ers team is as physical on both sides as anyone. They remind me of how Alabama plays." 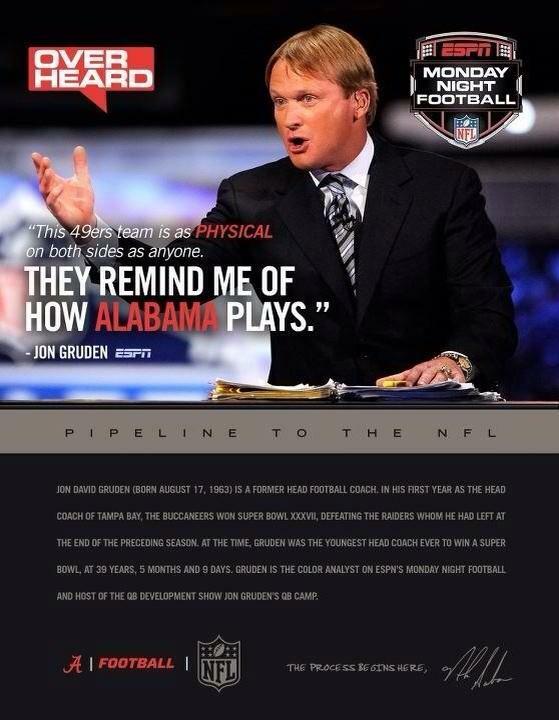 Being the smart people that they are, Nick Saban and his staff used this to their advantage in recruiting and sent out a flier with what Gruden said to recruits. This is why most college football experts think Nick Saban is a genius in recruiting. He can use things like this as an advantage for the Crimson Tide. But now wouldn't this all be interesting if Gruden (as some are predicting) took the Tennessee job? How do you think it would go over with Vol fans if Gruden were to take the UT job? My guess... about as well as that touchdown pass McCarron threw to Yeldon the other night in Baton Rouge.